Celtic and Rangers both faced tough ties in the first round of the Betfred Cup, albeit for different reasons. Celtic turned to a change in style to pull them through a rough period, while Rangers faced a robust Kilmarnock side off the back of a testing European tie against Maribor. Celtic, in the wake of consecutive defeats and a Champions League exit, used their League Cup fixture away to Partick Thistle to address one of their largest tactical deficiencies. The wide positioning of their tens in Athens prevented combinations between them, causing a rift between the right and left sides of a Hoops’ attack AEK stifled easily with a fairly well organised 4-4-2. Brendan Rodgers’ response saw Celtic move away from the asymmetric structure that he has utilised for much of his tenure in Glasgow, favouring a more traditional 4-2-3-1. The inclusion of Gamboa over Lustig at right back saw the Costa Rican push forwards, rather than remain as a third player in the first line of the Celtic build-up. With this, and with Izaguirre making his second debut for the club on the left, the Celtic approach carried a heavy central focus in advanced areas, driven forwards by advancing fullbacks on both sides. The visitors, however, were often unconvincing in their build-up play against the heavily man-oriented Partick 4-1-4-1 midfield block. Ajer and Hendry found it surprisingly challenging to convert their 2v1 against the lone striker Doolan into consistent progression, with the latter frequently being forced into unprepared dribbles in the right halfspace. The movements of the fullbacks, in these moments and when advancing to the final third, lacked the coordination or timing to provide adequate support in the early stages. Ironically, in a game where Brown’s falling back to the side of the defensive line would have blown the Thistle position wide open, him and Ntcham acted almost strictly in the centre of midfield. Except for some useful forward runs, their poor staggering made it easy for the home side to block immediate passage through the middle with strong marking. Brown and Ntcham’s positioning in the centre, and the marking that comes along with it, forces Hendry to build-up through the right halfspace. Gamboa’s mistimed supporting movement, and poor spacing between Rogic and Johnston leaves the centreback with few viable options in possession. This forced Celtic to go through the fullback areas to reach the large spaces behind the man-marking Partick Thistle eights. There, Brendan Rodgers sought to overload the hosts with a whirlwind of Rogic, Sinclair, and Johnston, receiving freely in the centre and halfspaces, running at the back line. However, such scenes were rare, as Johnston made frequent errors in his spacing and body positioning, while Rogic and Sinclair have already often shown a reluctance to engage in central combination play. The second half switch to 4-3-3 relieved some of the issues in the construction game. Scott Brown as a single pivot not only encouraged better midfield spacing, but also allowed him to fall out into the defensive line, dragging Thistle into more penetrable 4-4-2-like structures, opening central routes to the final third. Progression to higher players through these routes was nonetheless problematic at times. Despite promising scenes where Brown dragged his midfield marker into the front line before appearing in the central space behind to receive, much of his play fell down the right side, in assistance of the often-ailing Jack Hendry. More or less pinned to these positions to ensure a safe build-up option across from Ajer, the Celtic captain had reduced access to the left side and could not act so flexibly as a midfield option. The change of shape also served a purpose against the ball. Celtic’s pressing in the first half fell far below the standard set by Rodgers’ side in previous campaigns. 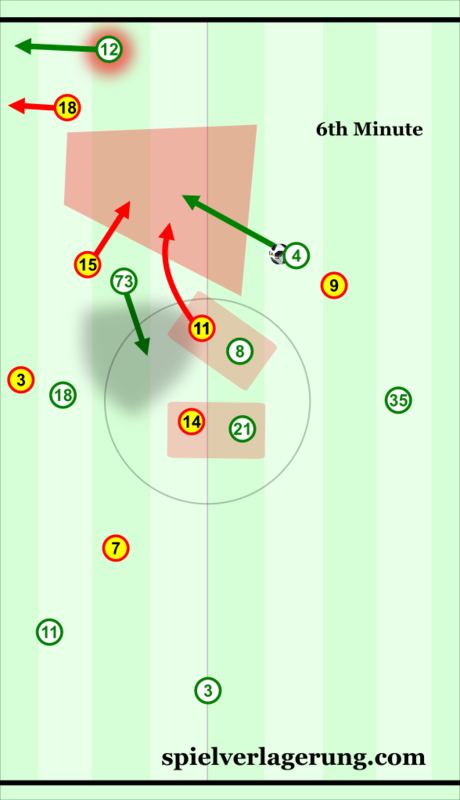 Their 4-4-2 displayed little compactness or staggering, giving the home side multiple spaces between the lines in which to play. With uncharacteristically low intensity pressing movements in the front lines, Partick freely used these areas to switch play and force Celtic into their own half. From the 4-1-4-1, Celtic still struggled to gain access to Penrice at the base of Partick’s midfield, but the restructuring of their own midfield gave them better coverage of deeper zones. However, though this should have made the Hoops better equipped to deal with the longer ball, the passive way in which the centre backs acted created large spaces around Brown in which the home side could run into or contest second balls. Indeed, it was this problem that led to the Thistle goal, as Ntcham was left with too much distance to recover with the deep defensive line, and Brown’s cover on the left flank opened the centre for Fitzpatrick to drive into well. Similar issues were found in the rest defence, both as Celtic attacked the Partick box and in moments when they pressed high. Hendry particularly was reluctant to push forwards on the right side on counter attacks and half-long clearances, giving the home side time to bring bodies to the Celtic half, and providing some awkward moments for the back line. In the end, success came in familiar forms for the Hoops. Celtic have often taken advantage of Partick’s defending of wide areas in the past, with Stuart Armstrong in particular performing well against the Jags in the past two seasons thanks to his strong diagonal runs from the centre, unleashing low crosses and shots from inside the box. That all three of Celtic’s goals were assisted from wide areas should, therefore, not be a great surprise. The addition of Forrest and the coordination between him and Gamboa to break through the back line on the right was the push that Celtic needed to turn their dominance of the possession stats into a winning score line. Across the city in the blue half of Glasgow, the feeling is slightly more optimistic. Rangers are yet to disappoint under the stewardship of Steven Gerrard, with convincing domestic performances coupled with exciting displays and resolute, professional results in Europa League qualifiers. Kilmarnock under Steve Clarke have consistently shown themselves to be one of the best organised teams in the country and continued that theme against Rangers. Their 4-4-2 defensive structure was typically very compact, giving away little space in advanced areas and effectively crowding the ball, whilst maintaining access to the far side through intense shifting movements. This intensity was carried into pressing actions as well, particularly between the Killie forward and midfield lines. Rangers found it difficult to bring the ball forwards through the middle due to the intense backwards pressing movements from Eamonn Brophy, while even Kris Boyd joined in on occasion in pressing his former side’s midfield. Pressing in such areas gives opportunities for counter attacks, and it is through these that Kilmarnock gained most of their inroads into Rangers territory. The coordination in Steve Clarke’s men’s defensive movements ensured that pressure exerted by the forward line on the Rangers defence was adequately backed up by the midfield, allowing Dicker to win possession in dangerous areas, being immediately supported by willing forward runners. 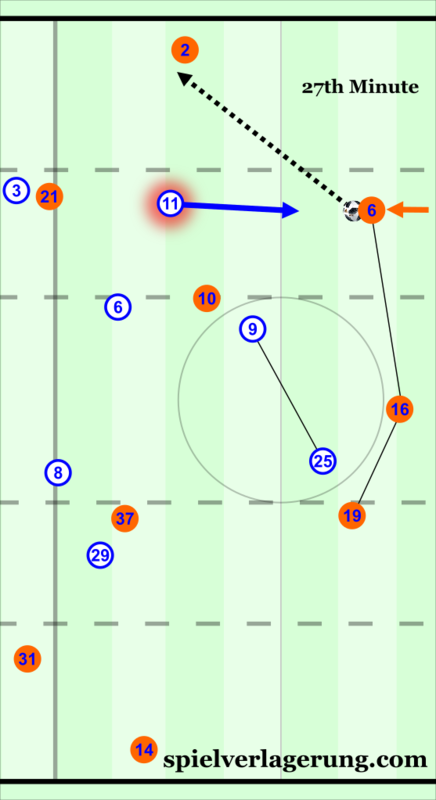 Alternatively, when the ball was won in deeper areas, the transition moment often took more of an individual form. Jordan Jones dragged his team forwards with his strong dribbling on the left flank, posing a threat as he cut inside on his right foot, to either shoot or bring the likes of Brophy and Burke into play. However, despite the obvious threat that Jones posed, his behaviours exposed his side to many of Rangers’ best attacks. Anticipating counter attacks and orienting slightly too heavily on the advancing James Tavernier saw the Killie winger detached from the midfield line, leaving a large space between him and Gary Dicker, offering little in the way of protection. The left side was similar at times, though not as frequently. However, the spaces either side of Dicker and Power were accessible often enough for Rangers to be a danger when advancing through them. Morelos dropping off the front line into the left halfspace to combine around the home side’s sixes was a familiar sight, while Arfield positioned himself well in the gap between Dicker and Jones to receive passes from the left side, giving him a clear route forwards and a short dynamic advantage. Indeed, Morelos’ first goal had its roots in the right halfspace. Candeias receiving a short switch there pinned left back Greg Taylor inside, for fear of opening a central passing line, preventing him from closing down Tavernier as readily as he sent in the cross for the guests to break the deadlock. Provoking Jones to press with a dribble allows Goldson to play round him easily with the advanced Tavernier. Candeias inside pins the left back. The problems caused by Rangers’ inward-moving wingers and general focus on the halfspaces did not stop there. With plenty of central options available, the Killie midfield duo of Power and Dicker were largely forced to stay in the middle to protect against them. Though typically aided in their efforts by Boyd and Brophy up front, blocking forward passes and pressing around the Rangers six space, the guests found ways to progress in their deeper build-up play simply by avoiding the centre and playing around them. A hallmark of Gerrard’s Rangers so far has been central midfielders dropping out to the fullback areas to facilitate dynamic wing triangles. This was similarly the case at Rugby Park, with a temporary back three being able to stretch wider across the first line of build-up, offering wing dribbles from the side backs and clearer angles to play into the advanced fullbacks. Though the falling out movements were often ineffective (particularly in the cases of Halliday and Arfield), more concerned with preventing counter attacks than progressing possession, the fullbacks were found by this means nonetheless – bringing the ball in front of the opposition back line, and avoiding the trap of sterile possession that Kilmarnock have lured previous opponents into. In what was a somewhat unattractive game, characterised by direct play on both sides, Steven Gerrard’s Rangers continued to impress. An intelligent approach to their build-up play saw them pick their way through a formidable opponent away from home, while inventive play at the top end shows further promise for the future for Rangers fans.